In this final volume, Sloterdijk’s „plural spherology“ moves from the historical perspective on humanity of the preceding two volumes to a philosophical theory of our contemporary era, offering a view of life through a multifocal lens. If „Bubbles“ was Sloterdijk’s phenomenology of intimacy, and „Globes“ his phenomenology of globalization, „Foams“ could be described as his phenomenology of spatial plurality: how the bubbles that we form in our duality bind together to form what sociological tradition calls „society.“ „Foams“ is an exploration of capsules, islands, and hothouses that leads to the discovery of the foam city. The „Spheres“ trilogy ultimately presents a theology without a God — a spatial theology that requires no God, whose death therefore need not be of concern. 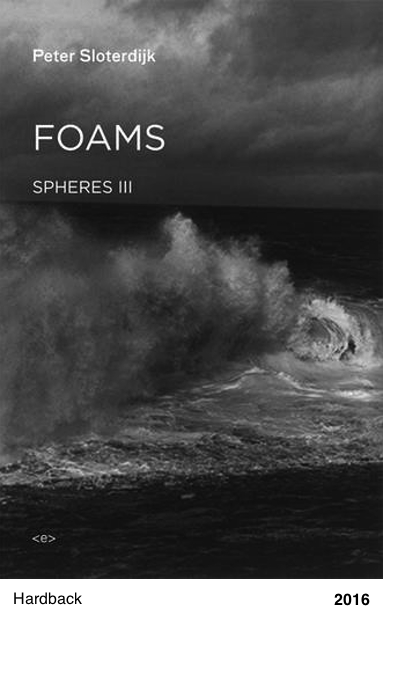 As with the two preceding volumes, „Foams“ can be read on its own or in relation to the rest of the trilogy.